Wash the car, water the flowers or simply soak your siding clean with a flick of the thumb! Sun Joe's Smart Throttle High-Pressure Hose Nozzle adjusts from gentle spray to high-pressure stream in one smooth move to ensure maximum water pressure and flow wherever you want it most. Durable, rubberized easy-grip ergonomic handle and nozzle resists damage, rust, leakage, stands up to abuse for years of reliable operation and dependable performance. Includes 2 high-pressure hose nozzles (1 red+ 1 green) and 2 splashless quick connect adapters to swap hose attachments on the fly without getting soaked - and no need to turn off the hose! This nozzle is completely adjustable, to spray from a fine mist to a heavy stream. It is made of high impact metal construction, with an Ergo Light comfort grip. The adjustable nozzle is brass with a tip protector. This nozzle offers a choice in spray patterns; find the right one for every task in the home and garden, from a gentle rain-like shower for gardens to a powerful jet spray perfect for clearing away debris. To modify water pressure, a thumb control knob allows a quick adjustment to the flow of water without going back to the faucet. The Orbit Pro Series Thumb Control Cannon Nozzle features 8 spray patterns. Find the right pattern for every task around the home and yard. Fingertip flow control modifies water pressure, allowing a quick adjustment to the flow of water without going back to the faucet. Unique flow-through design maximizes water pressure; up to 30% greater flow. Nothing beats the durability of solid brass construction when it comes to power and performance in the yard and garden. Wash the car, water the plants or pressure wash the patio and siding - you'll find dozens of uses for the Sun Joe SJI-4BHNC solid brass combo pack! The multi-purpose Sun Joe Twist Hose Nozzle quickly adjusts from gentle shower to high-pressure stream in one smooth motion. Resists damage, stands up to abuse for reliable operation to last a lifetime. Solid brass one-piece inner core resists leakage for exceptional performance. Turn your conventional garden hose into a high-pressure power washer with the one-piece Sun Joe Jet Sweeper Nozzle attachment. Instantly convert your standard garden hose into a pressure washing powerhouse to produce a concentrated jet stream to tackle a variety of heavy-duty cleaning tasks. One Touch Adjustable Hose Nozzle with Smart Throttle Control in Red/Green (2-Pack) Wash the car, water the flowers or simply soak your siding clean with a flick of the thumb! Sun Joe's Smart Throttle High-Pressure Hose Nozzle adjusts from gentle spray to high-pressure stream in one smooth move to ensure maximum water pressure and flow wherever you want it most. Durable, rubberized easy-grip ergonomic handle and nozzle resists damage, rust, leakage, stands up to abuse for years of reliable operation and dependable performance. 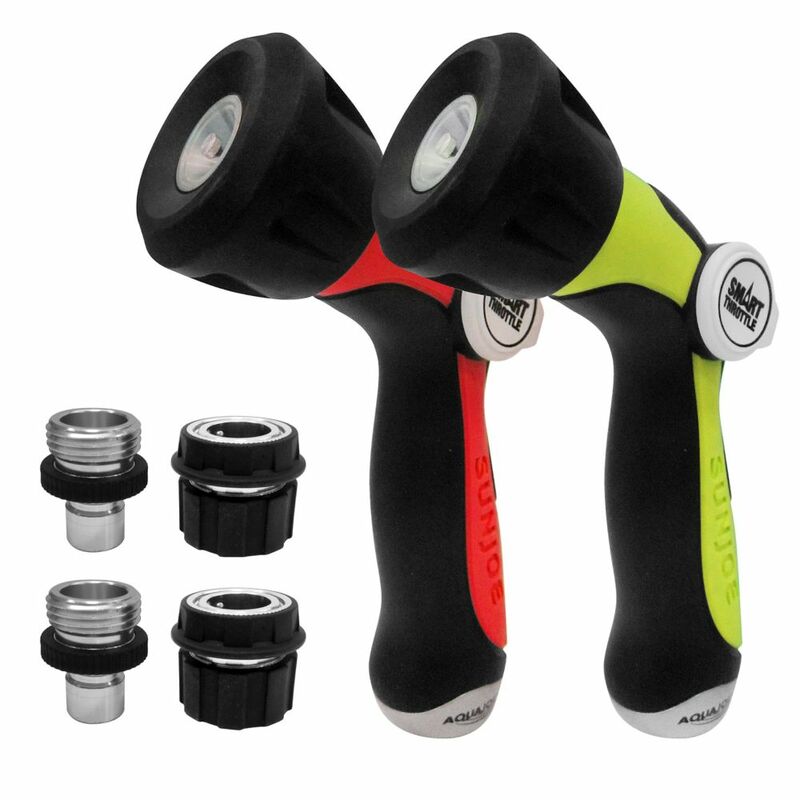 Includes 2 high-pressure hose nozzles (1 red+ 1 green) and 2 splashless quick connect adapters to swap hose attachments on the fly without getting soaked - and no need to turn off the hose! One Touch Adjustable Hose Nozzle with Smart Throttle Control in Red/Green (2-Pack) is rated 4.7 out of 5 by 415. Rated 5 out of 5 by Sandy Blue from Best bang for your buck I used to use power washer to was my cars. No more. This nozzle is easy and quick to use with all the control I need. Rated 5 out of 5 by cram from excellent nozzles! very sturdy and work haven't been able to use too often yet-hope they hold up as they seem to be! Rated 5 out of 5 by Jolivera48 from Great purchase High quality nozzles for a great price. Nozzles give out a great spray and are made of quality materials. Will buy again. Highly recommend.